its been an AWESOME DAY! Full of win. 1. I got my laptop at work today. What this means is when I'm home sick, or on vacation, or there's a horrific weather event or the building explodes, then I can still access all my super important information. 2. We got carpet!!!! YAAAAAAAAAAAAAAAAAAY Its so pretty and soft. ALSO? 3. THE KITTIES ARE HOME!!!!!!!! 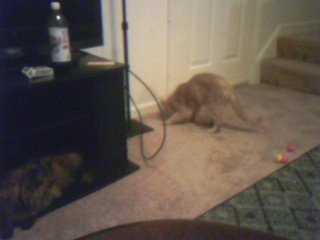 They seem a little unsure of the new carpet smell, and of course the furniture isn't in all the same places. Tripsie really seems to like the new TV Stand. Too bad stuff has to go there. (I discovered I could vertically flip the image my camera takes - that was mighty odd looking at my leg from upside down but it was pointed at me). So its actually backwards. 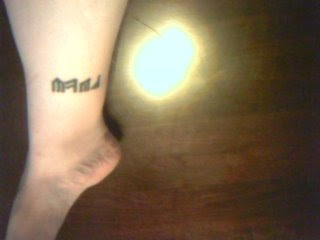 It says "Jadie" in one of the languages from Lord of the Rings. I've got another one on my back. Yay for being able to Werk at home, you're so lucky? I'm glad that you got your carpeting today and even more happy that your babies came home. Sorry for Shawn though. If your Tat is backwards then it spells "eidaJ," what does that mean? What a neat tatoo Jadie! It's kind of ironic, I was watching Clerks II last night (I love Kevin Smith & his movies tho' II wasn't one of the better ones), and one of the best parts of the movie was the Star Wars vs LOTR debate between Elias and Graves. Congrats on your new carpet and having the cats back home! I'm sure your apartment is now starting to feel like home again. New laptop that can be brought home - - lucky you! Glad you got that new carpet. We had a blast at the Biltmore. I will definitely go again because you really can't see everything in one day. We drove 2 hours from where we were staying on vacation to go see it. Dude was livin large that's all I can say! If I remember right, it's Elvish for "tree hugger". It may be something else though.